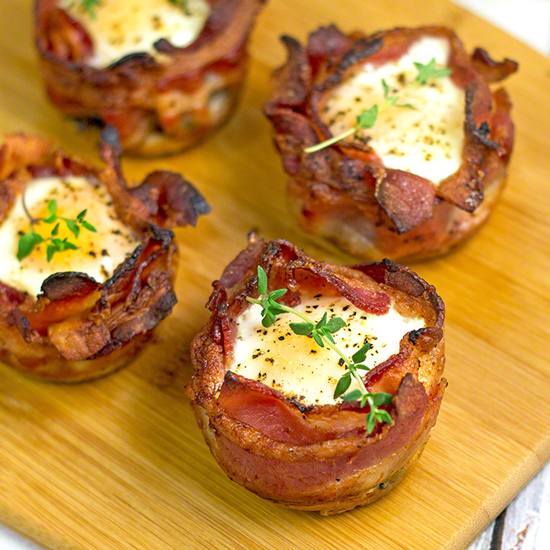 Bacon, egg, toast and veggies all in one muffin cup! Very nice weekend breakfast or brunch. I thought this concept was a terrific idea when I saw it on Stumble Upon. It’s not often that I’ll make anything fussy–and yes, these are a bit fussy–but in this case it’s worth it (at least I thought so). So when I did them “for reals,” I broke down and used spray and I sprayed each cup until it was white!!! Had no problem getting them out. I also used medium eggs because large (and anything over) overflowed the cup. I also used a different brand of bacon and regular, not thick cut. 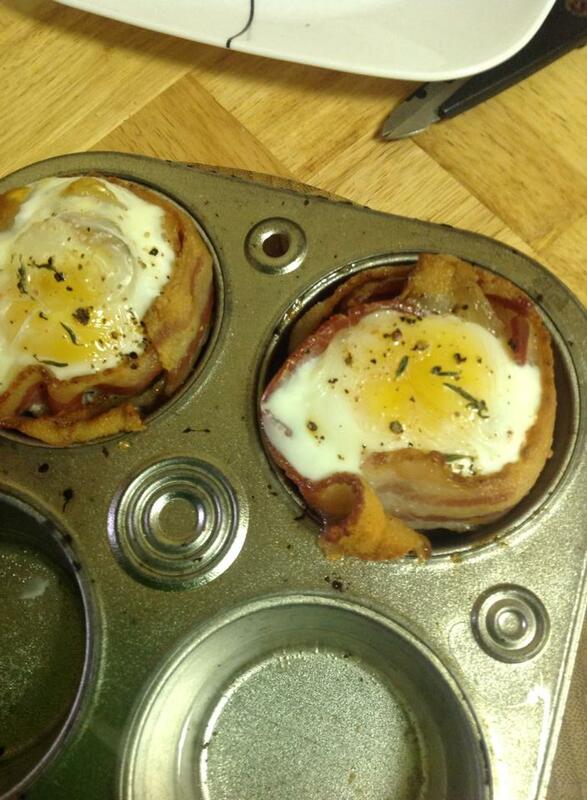 You can of course do this in a Texas–large size– muffin pan, then larger eggs will not present a problem. I will caution that you watch these very closely after about 10 minutes since the bacon will start to get over-crisp quickly. You want it crisp so the cup holds it’s shape but not burned. Spray or grease REALLY well a 6-count muffin pan. Really grease that sucka up or the bread or any errant egg white will stick like glue. I’d actually advise using non-stick here. 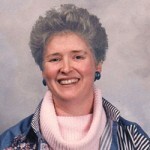 Partially cook bacon–it should NOT be cooked to crisp. This will just render a lot of the fat out of it. The bacon should be pliable. Drain on paper towels and cool slightly. Using a cookie cutter or a glass, cut circles roughly the size of the base of the muffin cup. If you choose to use mushrooms, drain all but 1 tbs of the bacon fat out of the frying pan. Saute mushrooms for about 5 minutes over medium heat. Set aside. Place a bread circle at the bottom of each muffin cup. 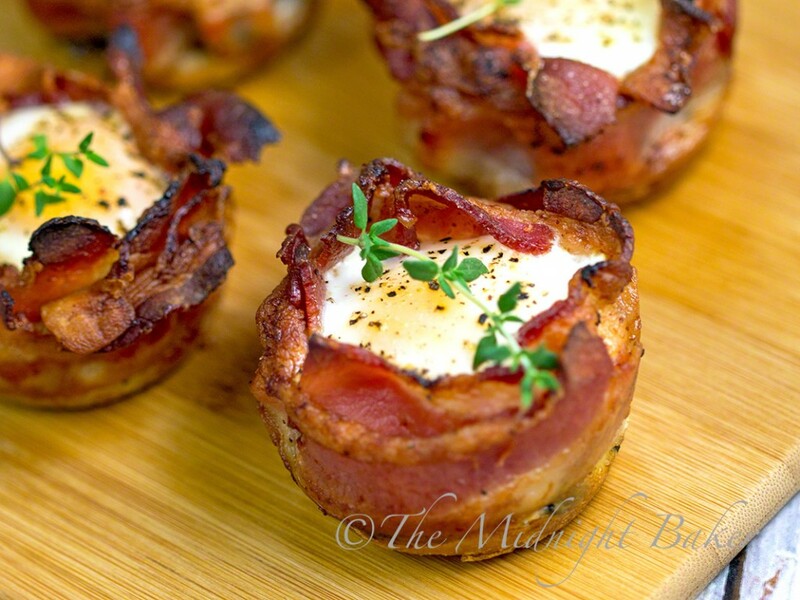 Now fit 2 slices of bacon loosely around the sides in each cup, overlapping as necessary, lining the sides of the muffin cup, forming a bacon “cup”. Place about 1 tbs of the mushrooms on top of the bread circle -OR- place sliced tomato on top of the bread circle. Finally, break egg and add to the bacon-lined cup on top of the mushrooms/tomato. Sprinkle top of each egg with salt, pepper, and a pinch of any of the herbs (or a combo of all of them) on top of each egg. Bake at 400 degrees F for 15-20 minutes, or until bacon is cooked to crisp–don’t overcook or the bacon will burn! How about some photos on how you assembled these "Cups" from what you posted I'm not getting how these are suppose to hold together or the bottom falling out… are you suppose to put the bacon in first then the bread? Being by myself it is difficult to take step by step pictures, which is why I tend not to do this. You put the bread in the muffin cup first, Then you wrap the bacon around the sides of the cup on top of the bread. To prevent gaps in the bacon, I put in the first slice wrapping it in the shape of the letter "C" then the second slice I place in the cup like the letter "C" reversed. 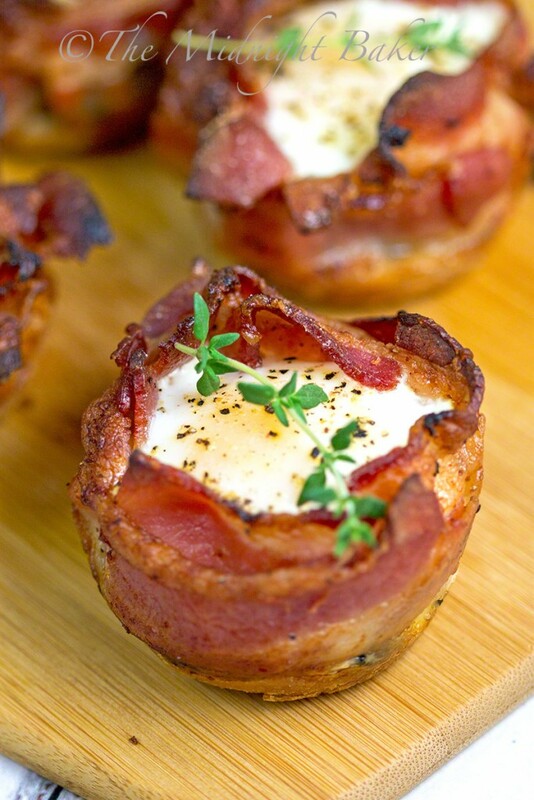 Then you break the egg in the "cup" formed by the bacon. Hope this helps. It won't fall apart if you grease the cups well. The egg is the "glue" that holds it all together. Thanks KC! 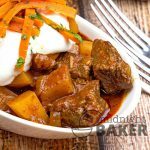 Hope you gals will post your great recipes on mine! Hi Tom–the "Print" button is right underneath the pics of "Recommended For You"–a little grey box on the right side. Make sure to choose print without photos (that box is at the top of the popup you'll get) otherwise it'll want to print 17 or so pages (one each for the photo). However, within the next 10 days I'm moving this site to a better platform where the recipe is highlighted in a box, with a pic, that will only print the recipe and the little thumbnail. How firm are the eggs after baking 15 to 20 minutes? Mine came out like “over easy” eggs–I used medium eggs though. 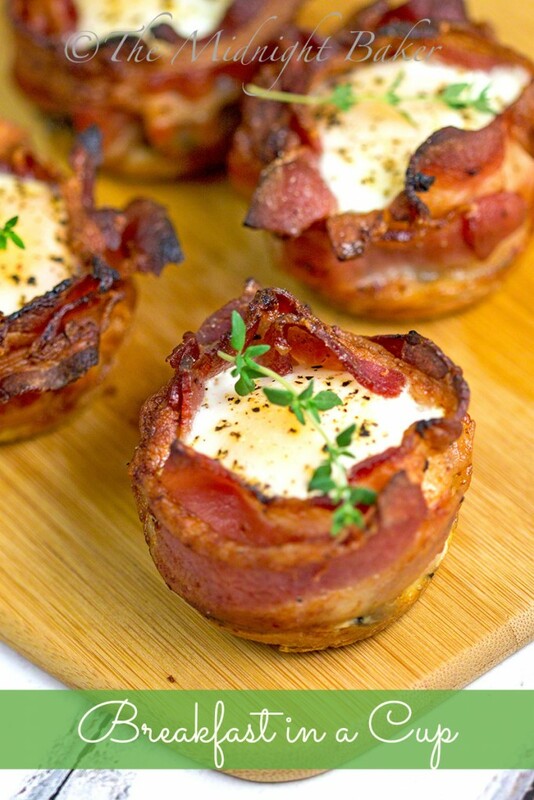 Great idea, can these be made a week ahead and frozen for a brunch? 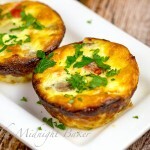 I wouldn’t freeze the egg, but what I’d do is make up everything else–minus the egg–and freeze them in the muffin cups. Then on the day you want them, then add the egg and bake as usual. It may take a minute or 2 longer if the “shell” is frozen. I made these! Very simple easy and delicious. Thank you so much! So glad you liked them! Happy New Year! I made these for husband and I as a test run for a girl’s weekend brunch option. these are absolutely delicious. i used whole wheat bread thins instead of regular bread, used tomato (not mushrooms), and for the herb I used fresh thyme. i also sprinkled just a few very thinly sliced green onions on top!! Amazingly light but filling. Only suggestion would be to bake a few mibutes less if you want your egg yolk runny. 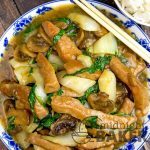 🙂 Thanks so very much for sharing this recipe! The green onion sounds like a great addition! So glad you all enjoyed them!!! Can you make them the night before and then heat in the microwave in the morning before work? I would avoid that because of the egg–and the mess it would make in the microwave. You’d have to pierce the yolk so it didn’t explode and that would destroy the egg. What I would do to prep in advance is make them up to the point of fitting the bacon in the muffin cups. 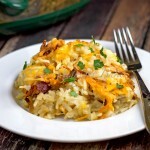 You can partially cook that if you wish, then just finish them off in the oven once you add the egg. Mine was perfect besides for my bread coming out soggy. Any suggestions on how to keep it dry and toasted? The bread is just going to be soggy. Really no way to prevent that.